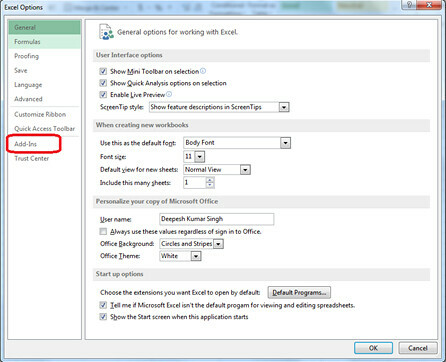 Today I got a challenge to provide a new function in Excel dashboard. 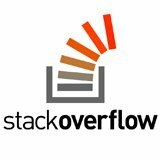 I am not an expert in VBA and have very less experience but it’s fun doing coding in VBA. It makes excel function so simpler that I really loved it. My few lines of code helped me to reduce 3 hours manual work to only 5 minutes. Thanks to Microsoft for providing such a powerful tool. Today I am going to explain a feature which is currently disabled in office 2010 or latest office but may be required in some project. 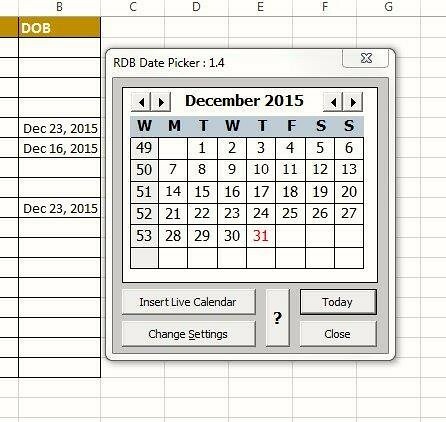 As title suggests, lets see how we can insert a VBA calendar in Excel without having ‘Microsoft date and time picker control 6.0’ in-built function. Before starting anything let us thank Ron de Bruin for providing the encrypted code (Excel Add-in code). Step 1: Go to Ron’s website and download the Date picker add-in. Click here to download. But you can save it anywhere. I would tell you later why I am saying to save it to this path. Step 4: Check the footer. You can see ‘Manage’ option. Select ‘Excel Add-Ins’ and Go. Step 5: Now click on ‘Browse’ and give the path where you saved the .XLAM file (Ron’s code). Now you might have got why I was talking about the above path. If you have already the saved the file somewhere else, you can paste it here again or can directly give the link. 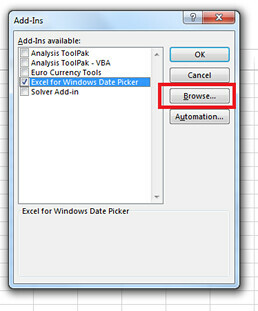 Step 7: The option “Excel for Windows Date Picker” should be enabled/ticked. By default it does so no need to worry. 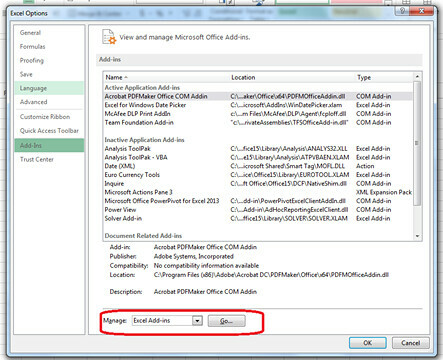 Step 8: Now right click on any cell. You will have an option to select ‘Date picker’. Nice job. We have done it. Save the excel file if you want or let it be. We just wanted to enable the ad-in which we did. 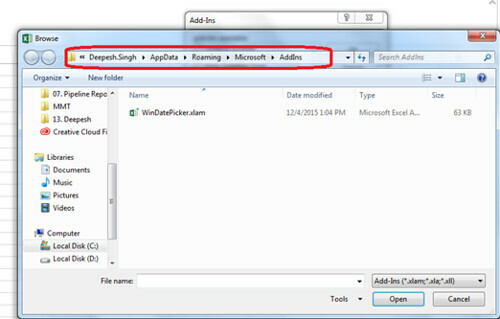 step 9: Let’s move one step ahead and do some more automation and call Date picker on any cell click. For that you can download my Excel worksheet and check code. 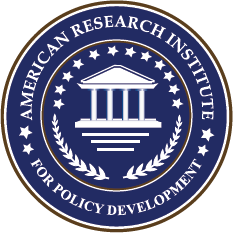 I am using the code from Ron’s website only. MsgBox "Sorry the Date Picker add-in is not open." I want to call this function whenever I click “B2:B20” cell. Thanks for reading. Let me know if you have some better solution. Looking forward for your comments. This entry was posted in Computer & Internet, WebAfflatus and tagged Data Analytic, Date, Excel, Excel Calendar, Microsoft, Office 2010, VBA, VBA Calendar. Bookmark the permalink. This looks great but I’m unable to download your workbook as the site has deleted it. Hi Graham, I sent you an email. Hope you have received it. 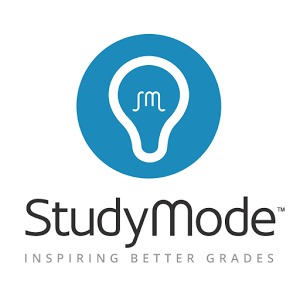 Hi Deepesh, Your post looks great but like Graham I also not able to download your workbook. Can you please send the same to Shahani.deepak@gmail.com.